At Robins Plumbing we promise our clients “A Higher Level of Service,” and that means a lot more to us than the service we provide, it also means we provide the highest level of plumbing parts on the market. We promise not to cut corners to save a buck, but rather invest in the parts that we provide and install in your home to potentially save you thousands. From the smallest of parts in your faucet to the larger plumbing fixtures in your home like water heaters and filtration systems, you can be confident that Robins Plumbing is installing the best quality plumbing parts available. 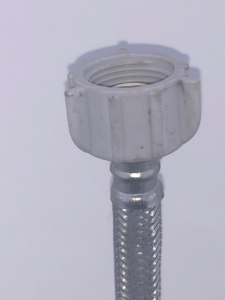 “There is a settlement with Interline Brands Inc, (“Interline”) about DuraPro toilet connectors with certain types of plastic coupling nuts that could fail and cause water damage. Interline denies that it has done anything wrong. The settlement covers the purchase and possession of a DuraPro toilet connector with the certain types of plastic coupling nuts and payments for replacement toilet connectors or repairs for property damage caused by the failure of the plastic coupling nuts. Who’s Included? The settlement includes anyone who owns or owned, or leases or leased, a residence or other structure located in the United States containing a DuraPro toilet connector with plastic coupling nuts with either a six0ribbed design or a bi-winged design, or who otherwise suffer or have suffered property damage from the failure of these plastic coupling nuts on the toilet connector. Images of included toilet connectors are available at www.duraprotoiletconnectorsettlement.com . What does the settlement provide? The settlement agreement provides for the payment of $16.5 million into a settlement fund to; (1) pay class Members for replacement of DuraPro toilet connectors and/or property damage due to failure of the coupling nuts; (2) covert notice and settlement administration expenses; (3) pay attorney’s fees as ordered by the court of up to one-third of the settlement fund (or $5.5 million), plus up to $500,000 in expenses; and (4) pay a total incentive award of up to $35,000 to the five Class Representatives ($5000 each). Yes, those numbers are in the millions in losses for damages from a defective plastic nut on the end of a toilet supply line. I wouldn’t wish a flood on my worst enemy, and that’s the truth. It is heartbreaking to watch a family go through a flood; it is just as bad as going through a fire. Your home and personal belongings are destroyed, and you are often forced to live outside of your home for 6-8 months as your home is put back together. With about 100,000 plumbing calls under my belt I’ve seen some things, some of those things I am still trying to block from my psyche. Flooding in our profession is a common by-product of a plumbing leak on the domestic water line. I’ve seen floods from water heaters without water heater pans, floods from broken angle stops, broken washing machine hoses and even running toilets that were stopped up. You would be amazed at the amount of water that can be unleashed in your home from those tiny places. A supply line that breaks can easily flood an entire home with inches of water while you’re away at work. Indoor pools when they are done on purpose are great, arriving home after a long day and having your entire home be an indoor pool is not so great. This notice got me thinking, “This is exactly why we only put in the top of the line parts” As a plumbing contractor I have a choice when it comes to the materials I put into our clients’ homes. I can use a cheaper part and increase my immediate profit margin, or I can put in the top of the line parts and increase my profit margin long-term. By providing a higher level of service by only providing the highest quality materials we can find, I am confident that I put parts into my clients’ homes that I would put in my very own. This is the type of toilet supply line that Robins Plumbing provides and installs. You can see the difference; this supply line has a metal nut on the end as opposed to the plastic cheaper version. That nut connects to the fill valve in your toilet tank. In my personal and professional opinion after more than 21 years in the plumbing profession, the metal nut is the better toilet supply line to choose. 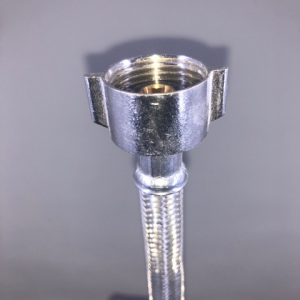 Out of the thousands of supply lines, we replace every year about 1% of them are toilet supply lines with metal connectors. That is why we choose to provide and install high-end metal toilet supply lines. Even the toilet fill valves that we provide and install have metal shanks rather than plastic. Our goal at Robins Plumbing is to provide A Higher Level of Service and longterm solutions to your plumbing problems.